What happens when you change domain name registrar? When you change your domain name, your current and new domain name registrar will process the request through ICANN (Internet Corporation for Assigned Names and Numbers). While the process for transferring domain names from your account with us to another domain name registrar depends on your new domain name registrar. There are confirmation steps that you need to complete at your current registrar and your new domain name registrar. Please note that ICANN’s Transfer Policy may prevent you from transferring your domain name within 60-days of a transfer. A domain name transfer is the process of moving a domain from one service/registrar to another. How do I change my domain name registrar from GoDaddy to Hover? Here’s the process that I followed when moving my domain name from GoDaddy to Hover. Check on Hover in the Transfer page to see if you domain name can be transferred. It will let you know if it can be transferred. If not, it will give you the following message. Hover, a service operated by Tucows, has received a request on Dec, 2015 for us to become the new registrar of record. Please read the following important information about transferring your domain name:You must agree to enter into a new Registration Agreement with us. You can review the full terms and conditions of the Agreement at the Hover website. Once a transfer takes place, you will not be able to transfer to another registrar for 60 days, apart from a transfer back to the original registrar,in cases where both registrars so agree or where a decision in the dispute resolution process so directs. Click here to confirm that you wish to transfer dejavuguides.com to Hover. This may vary if you’re moving another domain name registrar from GoDaddy, but GoDaddy sends an email letting you know that your domain name is going to be transferred to another domain name registrar. This is an example of the notice that I received from GoDaddy. GoDaddy received notification on December, 2015 that you requested a domain transfer to another domain name registrar. If you wish to cancel, or did not request this transfer, log in to your account before December, 2015 by clicking the button below to decline the transfer. You don’t need to do anything to accept this transfer. If we don’t hear from you before December, 2015, the transfer will proceed and any associated products or services will be canceled. If you wish to approve the transfer before this date, log in to your account and click “Transfer” above the list of your domains. After 5-odd calendar days, you will receive an email asking you to approve the move from your new domain name registrar. In this example, this is Hover. Approve the domain name transfer at your new domain name registrar by clicking on the approval link shared by your new domain name registrar. The below example, is the email from Hover to me. If you don’t click the link above, within 15 days, dejavuguides.com will be suspended by ICANN. The Internet Corporation for Assigned Names and Numbers (ICANN) requires that all domain name registrars verify that the first and last name of the registered owner of a domain name is accurate and that the email address is able to receive email. You recently registered, transferred, or modified the registration information for one or more of your domain names registered through Hover. Or an email sent to the email address associated with your domain was undeliverable. Any of those things happening requires us to re-verify the registration information. You’ll receive a confirmation email from your new domain name registrar after you have confirmed the transfer with them. You will receive something similar to I have received, as you will see below. As long as your billing information is accurate and up-to-date, we will renew this name on your behalf each year. You can now begin managing through your Hover account, Hover.com. Thanks very much for your business. We realize that you have a lot of choice out there, and appreciate that you chose us. You’ll also receive a confirmation email from your old domain name registrar. Here is an example from GoDaddy. Sorry to see you go. We’ll always welcome you back! 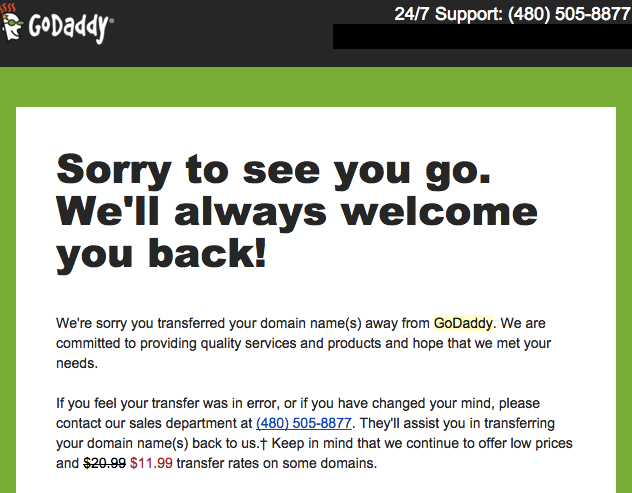 We’re sorry you transferred your domain name(s) away from GoDaddy. We are committed to providing quality services and products and hope that we met your needs. Keep in mind that we continue to offer low prices and $20.99 $11.99 transfer rates on some domains.